The cover of the first light novel featuring main character Shera. 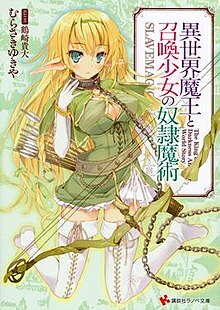 How Not to Summon a Demon Lord (Japanese: 異世界魔王と召喚少女の奴隷魔術, Hepburn: Isekai Maō to Shōkan Shōjo no Dorei Majutsu, transl. "The Other World Demon Lord and the Summoning Girl's Slave Magic") is a Japanese light novel series written by Yukiya Murasaki and illustrated by Takahiro Tsurusaki. The light novels are published in English by J-Novel Club. A manga adaptation by Naoto Fukuda has been running since 2015, and is licensed by Seven Seas Entertainment. An anime television series adaptation by Ajia-do Animation Works aired from July 5 to September 20, 2018. Takuma Sakamoto is a hikikomori gamer who is mysteriously transported to the world of his favourite MMORPG, Cross Reverie, with the appearance of his own character in the game, the Demon Lord Diablo. The two young girls who summoned him, the pantherian Rem and the elf Shera, attempt to use a spell to make Takuma their servant, but due to his passive "Magic Reflection" ability, the spell rebounds, and both end up with magic collars stuck on their necks, thus becoming his slaves instead. With a serious case of social anxiety, Takuma decides to act like his character while interacting with others, and makes use of his high stats and vast knowledge of Cross Reverie's lore to survive in his new environment, traveling along with Rem and Shera to look for a way to remove their slave collars while helping them with their own, personal issues that led them to summon him in the first place. Diablo is the male protagonist of the series. He was a Cross Reverie player who controlled the character Diablo, known as the true Demon King. He always defeated players with better equipment and overwhelming skills, always holding back for being too strong. But one day he was invoked in another world, reincarnating in the body of his character, Diablo, finding two girls, a Pantherian and an elf, who claimed to have summoned him and that he should be a slave to one of them, but due to his ring's ability, the magic has rebound back against them, becoming his slaves. Shera L. Greenwood is one of the female protagonists of the series. She is an Elf who is one of the two Summoners who summoned Diablo. The reason she summoned him was to have the strength to live free. She is 15. Rem Galleu is one of the female protagonists of the series. She is a Pantherian who became an invoker and had no choice but to become an adventurer and continue to demonstrate its strength, saying to aim to exterminate the Demon King Krebskrem. It is later revealed that the soul of Krebskulm is sealed in her body and in case she dies the soul will be released. Alicia Crystella is an Imperial Knight. She was born as a daughter of a duke house. Sylvie is the Guildmaster of the Adventurer's Guild in Faltra City. Edelgard is a Fallen (Demonic Being). She is shown riding a dragon-like creature, but as she enters into combat she descends from him and fights swiftly with her spear, this is because her demonic beast was paralyzed out of fear. She commanded the army that attacked the city of Faltra and was the superior of Gregore, but was defeated with the rest of the demonic beings by the supreme magic of Diablo. Krebskulm is the ruler of the Fallen (Demonic Beings). She has a fondness for biscuits. She later turns into her true from after Rem was attacked. The light novels are written by Yukiya Murasaki and illustrated by Takahiro Tsurusaki. Kodansha published the first volume under their Lanove Bunko imprint in December 2014. J-Novel Club announced their license to the series on September 28, 2017. "Heading to a New Town"
"Clearing a Dungeon, Part Two"
"Going to the Dark Elves' Forest"
Naoto Fukuda launched a manga adaptation of the series on Kodansha's Niconico based manga service Suiyōbi no Sirius in June 2015. Seven Seas Entertainment announced their license to the manga on September 14, 2017. An anime television series adaptation was announced in January 2018. The series is directed by Yūta Murano and written by Kazuyuki Fudeyasu, with animation by studio Ajia-do Animation Works. Character designs for the series are provided by Shizue Kaneko. Yuki Nishioka is the chief animation director. Yuki Miyamoto provides monster designs and serves as action animation director. Backgrounds are provided by Kusanagi, and Natsuko Otsuka is the color key artist. Photography for the series is directed by Teppei Satō at Asahi Production Shiraishi Studio, and Satoshi Motoyama is directing the sound at Half HP Studio. The series aired from July 5 to September 20, 2018, and was broadcast on AT-X, BS Fuji, Tokyo MX, and Sun TV. Crunchyroll is simulcasting the series worldwide outside of Asia, and Funimation is streaming a simuldub of it in North America. The series' opening theme, "DeCIDE", is performed by the unit SUMMONERS 2+, a group composed of voice actresses Azumi Waki, Yū Serizawa, Yumi Hara, Rumi Okubo, and Emiri Katō, and the ending theme, "Saiaku na Hi demo Anata ga Suki." (最悪な日でもあなたが好き。, "I Like You Even on the Worst Day. "), is performed by Serizawa and produced by HoneyWorks. The series ran for 12 episodes. Takuma Sakamoto, a secluded gamer, is transported into the world of his favourite game, Cross Reverie with the appearance of his own character in the game, the Demon Lord Diablo, where the pantherian Rem Galleu and the elf Shera L Greenwood accidentally fall into an enchantment that bound them to him as their slaves, thus beginning their adventures together. Diablo, Rem and Shera become adventurers at the city of Faltra to make ends meet, but in their first quest, they end up in a trap set by elves who want Shera to return with them. Diablo and Shera set for another quest while Rem stays behind at the city, when an army of Fallen prepare to invade. While Rem confronts the Fallen who sneaked past the town's defenses, Diablo faces the Fallen army and their leader Edelgard alone. Diablo and co. are informed that the elf Kingdom of Greenwood demands Shera to be returned to them, threatening to wage war on Faltra if they do not comply. To help on this matter, Alicia Crystella, a Imperial knight, is assigned to assist them. Diablo meets a slave owner looking for a way to remove the collars from Rem and Shera but to no avail, and later, they are visited by Shera's brother Keera, who is eager to take her back by any means necessary. Despite affirming that she wants to stay with Diablo and Rem, Shera submits to her brother's request to return with him, leaving Diablo disheartened, until Rem, certain that something is wrong, convinces him to chase after her. Diablo defeats the elves and rescue Shera. But Galford, the ruler of Faltra, takes advantage of the situation to launch an invasion on Greenwood, and Diablo must fight him to stop it. Edelgard reappears and offers Diablo a way to extract the demon lord Krebskrum from Rem's body without killing her. Meanwhile, rumors of a demon lord in Faltra brings Saddler, a ruthless and powerful Paladin, to the city. Diablo holds a ritual to release the demon lord Krebskrum from inside Rem, but just as he prepares to confront her, they learn that she holds no intention to destroy the other races as they believed and befriend her, giving her the name of "Klem". Now a friend to Diablo and the others, Klem accompanies them to the city, where Alicia reveals her true colors, kidnapping both Rem and Klem and turning them to Saddler as part of her plan have Klem fully awake as a demon lord. At the sight of Rem being gravely wounded, Klem becomes enraged and fully awakens into the demon lord Krebskrum. It falls to Diablo to contain Krebskrum's rage before she destroys the whole city. The light novels had over 1 million copies in print as of March 2018. ^ "How NOT to Summon a Demon Lord". Seven Seas Entertainment. Archived from the original on January 26, 2018. Retrieved January 26, 2018. ^ a b c d Pineda, Rafael Antonio (April 20, 2018). "How NOT to Summon A Demon Lord Anime's Main Cast, July Premiere Revealed". Anime News Network. Archived from the original on April 20, 2018. Retrieved April 20, 2018. ^ a b c "Jad Saxton on Twitter". Twitter. Retrieved 2018-07-26. ^ a b c d Hodgkins, Crystalyn (May 18, 2018). "How NOT to Summon A Demon Lord Anime Reveals More Cast, New Visual, Opening Theme Artists". Anime News Network. Archived from the original on 2018-05-19. Retrieved May 18, 2018. ^ a b c d e f g "Our Summer 2018 SimulDub lineup is just for you!". Funimation. June 21, 2018. Archived from the original on 2018-07-31. Retrieved July 30, 2018. ^ "Kristi Rothrock on Twitter". Twitter. Retrieved August 9, 2018. ^ a b c d Sherman, Jennifer (June 1, 2018). "How NOT to Summon A Demon Lord Anime Reveals More Cast, July 5 Premiere". Anime News Network. Archived from the original on 2018-06-26. Retrieved June 1, 2018. ^ "Madeleine Morris on Twitter". Twitter. Retrieved 2018-09-27. ^ a b c Loo, Egan (June 30, 2018). "How NOT to Summon a Demon Lord Anime Unveils 3 More Cast Members". Anime News Network. Archived from the original on 2018-06-30. Retrieved June 30, 2018. ^ "Jeremy Inman on Twitter". Twitter. Retrieved September 20, 2018. ^ a b "J-Novel Club Adds How NOT to Summon a Demon Lord Light Novel". Anime News Network. October 2, 2017. Archived from the original on January 26, 2018. Retrieved January 25, 2018. ^ Komatsu, Mikikazu (March 21, 2018). ""How NOT to Summon a Demon Lord" Reveals Anime Visuals of Its Two Heroines: Shera & Rem". Crunchyroll. Archived from the original on 2018-06-12. Retrieved June 1, 2018. ^ "異世界魔王と召喚少女の奴隷魔術". Kodansha (in Japanese). Archived from the original on January 26, 2018. Retrieved January 25, 2018. ^ "How NOT to Summon a Demon Lord: Volume 1". Amazon.com. Retrieved January 25, 2018. ^ "異世界魔王と召喚少女の奴隷魔術２". Kodansha (in Japanese). Archived from the original on January 26, 2018. Retrieved January 25, 2018. ^ "How NOT to Summon a Demon Lord: Volume 2". Amazon.com. Retrieved January 25, 2018. ^ "異世界魔王と召喚少女の奴隷魔術３". Kodansha (in Japanese). Archived from the original on January 26, 2018. Retrieved January 25, 2018. ^ "How NOT to Summon a Demon Lord: Volume 3". Amazon.com. Retrieved March 22, 2018. ^ "異世界魔王と召喚少女の奴隷魔術４". Kodansha (in Japanese). Archived from the original on January 26, 2018. Retrieved January 25, 2018. ^ "How NOT to Summon a Demon Lord: Volume 4". Amazon.com. Retrieved May 26, 2018. ^ "異世界魔王と召喚少女の奴隷魔術５". Kodansha (in Japanese). Archived from the original on January 26, 2018. Retrieved January 25, 2018. ^ "How NOT to Summon a Demon Lord: Volume 5". Amazon.com. Retrieved August 9, 2018. ^ "異世界魔王と召喚少女の奴隷魔術６". Kodansha (in Japanese). Archived from the original on January 26, 2018. Retrieved January 25, 2018. ^ "How NOT to Summon a Demon Lord: Volume 6". Amazon.com. Retrieved October 22, 2018. ^ "異世界魔王と召喚少女の奴隷魔術７". Kodansha (in Japanese). Archived from the original on January 26, 2018. Retrieved January 25, 2018. ^ "How NOT to Summon a Demon Lord: Volume 7". Amazon.com. Retrieved March 11, 2019. ^ "異世界魔王と召喚少女の奴隷魔術８". Kodansha (in Japanese). Archived from the original on January 26, 2018. Retrieved January 25, 2018. ^ "How NOT to Summon a Demon Lord: Volume 8". Amazon.com. Retrieved April 1, 2019. ^ "異世界魔王と召喚少女の奴隷魔術９". Kodansha (in Japanese). Archived from the original on January 26, 2018. Retrieved January 25, 2018. ^ "異世界魔王と召喚少女の奴隷魔術１０". Kodansha (in Japanese). Archived from the original on June 13, 2018. Retrieved June 13, 2018. ^ "異世界魔王と召喚少女の奴隷魔術１１". Kodansha (in Japanese). Archived from the original on 2018-09-12. Retrieved October 22, 2018. ^ a b "Seven Seas Licenses How NOT to Summon a Demon Lord Manga". Anime News Network. September 14, 2017. Archived from the original on January 26, 2018. Retrieved January 25, 2018. ^ "異世界魔王と召喚少女の奴隷魔術（１）". Kodansha (in Japanese). Archived from the original on January 26, 2018. Retrieved January 26, 2018. ^ "How NOT to Summon a Demon Lord Vol. 1". Seven Seas Entertainment. Archived from the original on January 26, 2018. Retrieved January 26, 2018. ^ "異世界魔王と召喚少女の奴隷魔術（２）". Kodansha (in Japanese). Archived from the original on January 26, 2018. Retrieved January 26, 2018. ^ "How NOT to Summon a Demon Lord Vol. 2". Seven Seas Entertainment. Archived from the original on January 26, 2018. Retrieved January 26, 2018. ^ "異世界魔王と召喚少女の奴隷魔術（３）". Kodansha (in Japanese). Archived from the original on January 26, 2018. Retrieved January 26, 2018. ^ "How NOT to Summon a Demon Lord Vol. 3". Seven Seas Entertainment. Archived from the original on January 26, 2018. Retrieved January 26, 2018. ^ "異世界魔王と召喚少女の奴隷魔術（４）". Kodansha (in Japanese). Archived from the original on January 26, 2018. Retrieved January 26, 2018. ^ "異世界魔王と召喚少女の奴隷魔術（５）". Kodansha (in Japanese). Archived from the original on January 26, 2018. Retrieved January 26, 2018. ^ "異世界魔王と召喚少女の奴隷魔術（６）". Kodansha (in Japanese). Archived from the original on January 26, 2018. Retrieved January 26, 2018. ^ "アクリルキーホルダー２種付き　異世界魔王と召喚少女の奴隷魔術（６）特装版". Kodansha (in Japanese). Archived from the original on January 26, 2018. Retrieved January 26, 2018. ^ "異世界魔王と召喚少女の奴隷魔術（７）". Kodansha (in Japanese). Archived from the original on 2018-07-05. Retrieved July 19, 2018. ^ "両面お風呂ポスター付き　異世界魔王と召喚少女の奴隷魔術（７）特装版". Kodansha (in Japanese). Archived from the original on 2018-07-08. Retrieved July 19, 2018. ^ "How NOT to Summon a Demon Lord Light Novels Get TV Anime". Anime News Network. January 25, 2018. Archived from the original on January 26, 2018. Retrieved January 26, 2018. ^ a b c d Loo, Egan (March 21, 2018). "How NOT to Summon a Demon Lord Anime's Promo Video Reveals Staff, Summer Debut". Anime News Network. Archived from the original on March 21, 2018. Retrieved March 21, 2018. ^ Ressler, Karen (June 21, 2018). "Crunchyroll, Funimation to Stream Attack on Titan 3, Overlord III, How NOT to Summon A Demon Lord, Angels of Death". Anime News Network. Archived from the original on 2018-06-22. Retrieved June 21, 2018. ^ "OPテーマ「DeCIDE／SUMMONERS 2+」". isekaimaou-anime.com (in Japanese). Archived from the original on 2018-07-05. Retrieved July 19, 2018. ^ Sherman, Jennifer (April 26, 2018). "Yū Serizawa Performs How NOT to Summon A Demon Lord's Ending Song". Anime News Network. Archived from the original on April 26, 2018. Retrieved April 27, 2018. ^ Sherman, Jennifer (June 13, 2018). "How NOT to Summon A Demon Lord Anime Reveals Promo Video, Visual". Anime News Network. Archived from the original on 2018-06-21. Retrieved June 13, 2018. ^ "BD/CD". Archived from the original on 2018-08-10. Retrieved August 10, 2018. ^ "第1話　魔王演技" [Episode 1: "The Demon Lord Act"]. isekaimaou-anime.com (in Japanese). Archived from the original on 2018-07-07. Retrieved July 7, 2018. ^ "第二話　最強新人" [Episode 2: "The Strongest Newcomer"]. isekaimaou-anime.com (in Japanese). Archived from the original on 2018-07-13. Retrieved July 13, 2018. ^ "第三話　魔族襲来" [Episode 3: "Fallen Assault"]. isekaimaou-anime.com (in Japanese). Archived from the original on 2018-07-21. Retrieved July 21, 2018. ^ "第四話 迫撃乱舞" [Episode 4: "Point-Blank War Dance"]. isekaimaou-anime.com (in Japanese). Archived from the original on 2018-07-28. Retrieved July 27, 2018. ^ "第5話 国家騎士" [Episode 5: "Imperial Knights"]. isekaimaou-anime.com (in Japanese). Archived from the original on 2018-08-05. Retrieved August 5, 2018. ^ "第6話 奴隷市場" [Episode 6: "Slave Market"]. isekaimaou-anime.com (in Japanese). Archived from the original on 2018-08-22. Retrieved August 22, 2018. ^ "第7話 人心変転" [Episode 7: "Change of Heart"]. isekaimaou-anime.com (in Japanese). Archived from the original on 2018-08-22. Retrieved August 22, 2018. ^ "第8話 英雄驀進" [Episode 8: "Hero's Charge"]. isekaimaou-anime.com (in Japanese). Archived from the original on 2018-09-07. Retrieved September 7, 2018. ^ "第9話 聖騎士譚" [Episode 9: "Holy Knight Tale"]. isekaimaou-anime.com (in Japanese). Archived from the original on 2018-09-07. Retrieved September 7, 2018. ^ Komatsu, Mikikazu (March 21, 2018). ""How NOT to Summon a Demon Lord" Reveals Anime Visuals of Its Two Heroines: Shera & Rem". Crunchyroll. Archived from the original on 2018-06-12. Retrieved June 8, 2018.